I’ve come across a number of posts recently regarding prayer and Christopher Hitchens, an unlikely pairing. 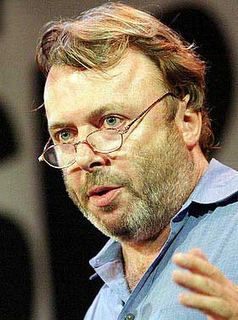 Regrettably the pairing has been occasioned by Mr. Hitchens’ recent diagnosis with cancer. Since the release of his 2007 book, God Is Not Great: How Religion Poisons Everything , which among other accolades won an award for most subtle subtitle (admittedly, that was an award of my own devising of which Mr. Hitchens was never advised), Hitchens has earned a certain notoriety with the sorts of people that would be inclined to pray for those who are ill and who are now, in fact, offering their prayers on his behalf. The whole situation has raised certain questions about the appropriateness of prayer for those who may not desire them and the ethics of making it publicly known that you are praying for a public figure. On Thursday, I almost posted David Brog’s “Praying for Christopher Hitchens,” except that, on the whole, Brog’s piece left me a bit uneasy. It may be that Ross Douthat’s “Prayers for Christopher Hitchens” originated in the same sense of unease. Douthat also includes a link to post on CNN’s religion blog, “My Take: Why Christians should pray for Christopher Hitchens,” which at the time I’m writing this had elicited over 1,200 comments. CH: Well look, I mean, I think that prayer and holy water, and things like that are all fine. They don’t do any good, but they don’t necessarily do any harm. It’s touching to be thought of in that way. It makes up for those who tell me that I’ve got my just desserts. It’s, I’m afraid to say it’s almost as well-founded an idea. I mean, I don’t, they don’t know whether prayer will work, and they don’t know whether I’ve come by this because I’m a sinner. HH: Oh, I…has anyone actually said that to you? CH: Well, I mean, I don’t mind. It doesn’t hurt me. But for the same reason, I wish it was more consoling. But I have to say there’s some extremely nice people, including people known to you, have said that I’m in their prayers, and I can only say that I’m touched by the thought.